The Blues are looking to make it three wins in a row as the Machans seek to get back to winning ways. In a clash of two southern Indian Super League (ISL) clubs, table-toppers Bengaluru FC take on their regional rivals Chennaiyin FC in what is being billed as the "Southern Derby" at the Kanteerava Stadium in Bengaluru on Sunday. Albert Roca's side are on the back of a run that has seen them pick up six out of a possible nine away points. The Blues return to home comforts after playing three consecutive games on the road and have a 100% record at home in this year's ISL. The run has allayed fears of a recurrence their last I-League campaign where they had a horror run of form after winning their first three games at home. 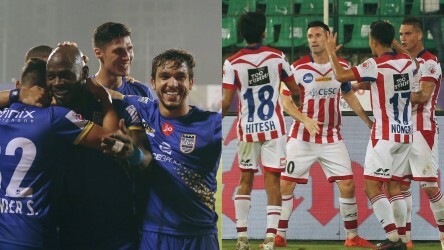 Their opponents on the other hand, are on the back of a loss to Mumbai City and prior to this played out an enthralling encounter against ATK at the Marina Arena. Coach John Gregory has moulded his side around the tricky and lethal Jeje Lalpekhlua. The side lie in 3rd place three points behind their opponents. While Roca would be looking to keep his team's run of form going, Gregory would want to bring a semblance of consistent form back to his ranks. FC Goa stormed to a 5-2 victory against Kerala Blasters thanks to a Ferran Corominas hat-trick and a Manuel Lanzarote brace. Roca will look to rotate the squad as the Blues are in action again on Thursday. 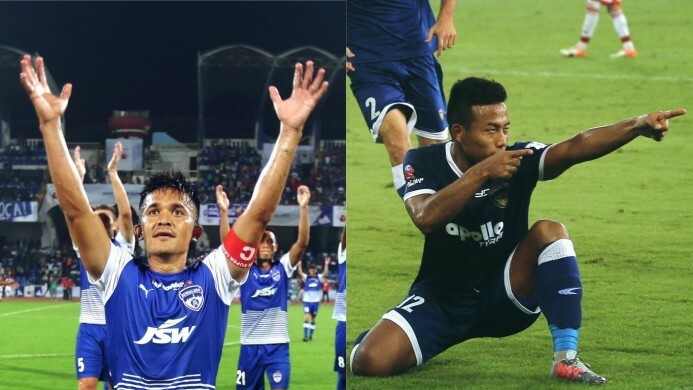 The trio of Sunil Chhetri, Miku and Udanta Singh will continue to spearhead the attack. It is at the back that the Spaniard made a shuffle against FC Pune City by bringing Subashish Bose for John Johnson. The midfield trio of Edu Garcia, Braulio Nobrega and Dimas Delgado were fluid on the ball and are in contention for another start. Ace goalkeeper Gurpreet Singh Sandhu is in line for a return after serving his 2-match suspension. Gregory on the other hand, would be looking to start Jeje after his introduction into the game brought the visitors to life against Mumbai. Raphael Augusto is also in line for a start after coming on as a substitute against the Islanders. The Englishman may look towards Bikramjit Singh to solidify his midfield if his intention is to hold fort and look for a point. This will be the first encounter between the two teams. Miku-Bengaluru FC: The Venezuelan international has hit the ground running with his new side with six goals and his unique goal celebration. He is on a scoring streak which includes a hat-trick against FC Goa. Roca will look to the veteran to continue this run of form and make it three wins out of three for the Steelmen. Jeje Lalpekhlua-Chennayin FC: The striker offers Gregory an added dimension in attack with his pace and work-rate. His introduction against Mumbai saw the side play better and this could inspire the Englishmen to hand him a start on Sunday to trouble the home side's backline. Bengaluru FC: Gurpreet, Khabra, Johnson, Juanan, Bheke, Lenny, Paartalu, Garcia, Udanta, Chhetri, Miku. Chennayin FC: Karanjit, Calderon, Sereno, Alves, Jerry, Dhanpal, Thoi, Thapa, Mihelic, Jeje, Nworuh. Chennayin FC have scored nine goals in this year's ISL, four behind their opponents Bengaluru FC. Bengaluru FC are the 2nd top passing side in ISL 2017-18. The two sides have both punted in 66 crosses into the box in this year's edition of the ISL. The match will be broadcast on Star Sports 2 and Star Sports HD 2 at 5:30pm. It will also be available for streaming on Hotstar and Jio TV.